I saw something very strange and upsetting this afternoon. I went out to throw down some birdseed in the back yard, and I saw Coco (the brown and white pigeon in the middle) and her mate under the tree. So I started throwing down the seed, and Coco and her mate flew off toward the pond. I watched them go. The next thing I see is another bird - I don't know if it was a pigeon or not - fly out of the tree and after Coco. And it attacks her in mid-air and forces her down into the pond. Then it uses its feet to hold her down in the water. So I started screaming and yelling and waving my arms, and the attacking bird flew off. I'm sure it was only a few seconds, but it seemed so much longer. Coco popped her head up and flew off as well, but there were a lot of her feathers left behind in the water. About an hour later I went back out and stood under the tree with a container of seed. 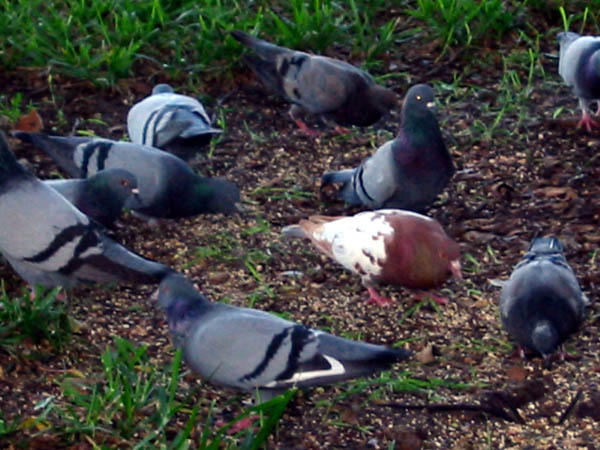 Usually, the flock of pigeons I feed will fly over from the building where they nest when they see me under the tree. They fly to the roof of my building and watch me while I litter the ground with birdseed. About half the time they'll start coming down while I'm still throwing down the seed; it's not unheard of for me to be standing there with 20 pigeons within a few feet of me. But this time, Coco wasn't with them. The flock has come back twice since, and still no Coco. I hope she's okay and just scared, rather than seriously hurt. I also got my Christmas present from Roo today - the typewriter key initial necklace I was coveting from UncommonGoods.com! It is SUPER COOL and looks wonderful. I'm wearing it right now and plan to never take it off ever.